Anthony Stark, son of industrialist Howard Stark, demonstrated his mechanical aptitude and inventive genius at a very early age, enrolling in college electrical engineering program at the Massachusetts Institute of Technology at the age of 15. When he was 21, he inherited his father's business, Stark Industries, and within a few years turned it into a multimillion-dollar industry complex whose chief contracts were for weaponry and munitions for the U.S. government. Steve Rogers was born during the Depression and grew up a frail youth in a poor family. His father died when he was a child, his mother when he was in his late teens. Horrified by newsreel footage of the Nazis in Europe, Rogers was inspired to try to enlist in the Army but was rejected. Overhearing the boy's earnest plea to be accepted, General Chester Phillips of the U.S. Army offered Rogers the opportunity to take part in a special experiment called Operation: Rebirth. Rogers agreed and was taken to a secret laboratory in Washington, D.C. where he was introduced to Dr. Abrahan Erskine (code named: Prof. Reinstein), the creator to the Super-Soldier formula. After weeks of tests, Rogers was at last administered the Super-Soldier serum. Given part of the compound intravenously and another part orally, Rogers was then bombarded by "vita-rays," a special combination of exotic (in 1941) wavelengths of radiation designed to accelerate and stabilize the serum's effect on his body. Steve Rogers emerged from the vita-ray chamber with a body as perfect as a body can be and still be human. A Nazi spy who observed the experiment murdered Dr. Erskine mere minutes after its conclusion. Erskine died without fully committing the Super-Soldier formula to paper, leaving Steve Rogers the Sole beneficiary of his genius. During the final days of the war, he was trying to stop a bomb-loaded drone-plane launched by Nazi technician Baron Heinrich Zemo when the plane exploded, killing his partner Bucky; and throwing him unhurt into icy Arctic waters. The Super-Soldier formula prevented crystallization of Captain America's bodily fluid, allowing him to enter a state of suspended animation. 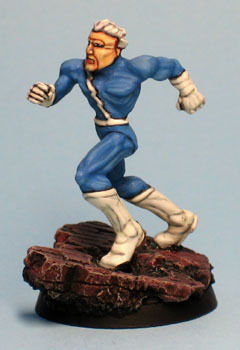 Decades later, he was rescued by the newly-formed Avengers and became a cornerstone of the team. His might undiminished. 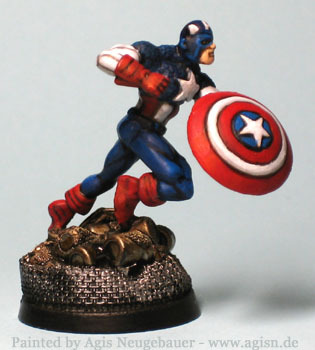 Captain America remains a symbol of liberty and justice. Descended from Norse gods, Thor nearly started a war by violating a truce with his family's ancient enemy -the Frost Giants. Odin, his father, banished the young god of thunder to Earth without his memory, to teach Thor how to behave as a mere mortal. After a decade as an earthly doctor, Donald Blake was drawn to Norway, and a subsequent encounter with a race of warmongering aliens. 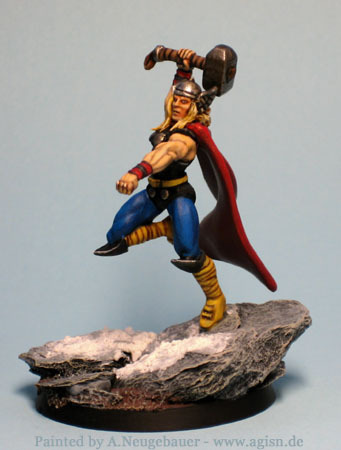 While hiding out in a cave, Blake found a mysterious wooden cane that turned out to be the enchanted hammer Mjolnir -- which transformed him back into the mighty Thor. 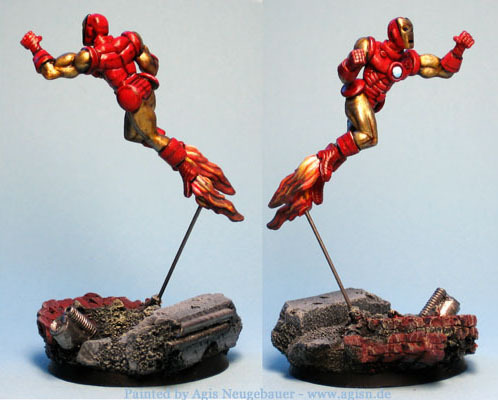 He drove off the alien invaders and took his place with the Avengers. Shaking off the Blake persona, Thor was soon forced to assume the human identity of EMS technician Jake Olsen. Thor is forever torn between his divine home -the hallowed halls of Asgard - and the troubled lands of his adopted home, Earth. The metal monstrosity called Ultron created the synthetic humanoid known as the Vision from the remains of the original, android Human Torch of the 1940s to serve as a vehicle of vengeance against the Avengers, Earth's Mightiest Heroes. Himself constructed by size-changing scientist Henry Pym, Ultron inadvertently gained sentience and rebelled against the Avengers' resident roboticist. The living machine programmed the Vision's neural processors with the brain patterns of the ionically charged costumed champion called Wonder Man and implanted a control crystal to keep him in check. 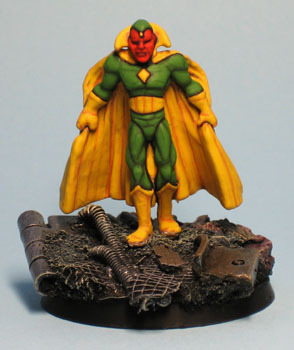 The Vision served the Avengers faithfully for a number of years, standing with his teammates against the foes no single hero could defeat. Tentatively at first, the almost-human android embarked on a romantic relationship with the hex-casting heroine called the Scarlet Witch that blossomed into true love and marriage. 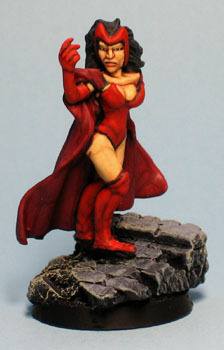 Wanda Maximoff was the daughter of the mutant called Magneto who pressed her into service in his Brotherhood of Evil Mutants, costumed her, and named her the Scarlet Witch. For months she and her brother Pietro (Quicksilver) served Magneto out of a sense of obligation and fear of his reprisal. When the extraterrestrial Stranger transported Magneto from Earth, the Scarlet Witch and Quicksilver left the Brotherhood and petitioned for membership in the Avengers. They were inducted along with Hawkeye to take the place of the charter members, who wished a leave of absence. At one point during her career as an Avenger, the Scarlet Witch underwent training in sorcery under the tutelage of a true witch named Agatha Harkness. The mental discipline of sorcery aided the Scarlet Witch's powers of concentration, enabling her to exercise much greater control over her mutant hexes than ever before. While an active member of the Avengers, the Scarlet Witch met, became romantically involved with, and married the synthetic man called the Vision. Pietro Maximoff and his sister Wanda (the Scarlet Witch) are the children of the mutant called Magneto. Magneto pressed them into service in his Brotherhood of Evil Mutants, costumed them, and named them the Scarlet Witch and Quicksilver. For months they served Magneto out of a sense of obligation and fear of his reprisal. As members of the Brotherhood, Quicksilver and the Scarlet Witch aided Magneto in his terrorist campaigns against humanity and helped him combat the original members of the X-Men. When the Brotherhood was defeated by the overwhelming powers of the alien Stranger, Quicksilver and the Scarlet Witch quit the Brotherhood and became later in their careers members of the Avengers, a world-renowned team of super heroes. 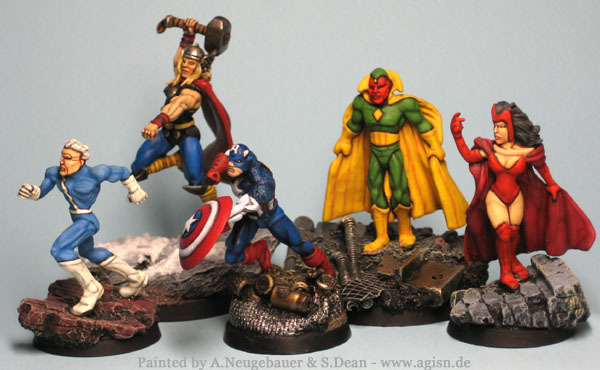 They were inducted along with Hawkeye to take the place of the charter members, who wished to take a leave of absence. Although the hot-tempered Quicksilver and Hawkeye often both rebelled against his orders, Avengers leader Captain America moulded them into valuable team members. Humanity's suspicion of mutants still rankled Quicksilver, and he briefly rejoined Magneto after the latter returned to Earth, compelling his sister to come with him. Months after the X-Men and Avengers defeated Magneto, Quicksilver and the Scarlet Witch resumed their membership in the Avengers.